Normally you are looking for about 0.5 volts at the ECU for a RB26 TPS sensor at the ECU. 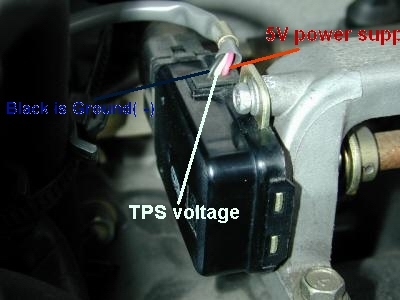 There are two connectors on the TPS sensors. One is a simple open/closed switch, the other has a rheostat in it, and it measures the position of the throttle actuator, and feeds that 0.5 volt to 4.5 volt signal to the ECU. The easiest way to check it is with a Consult type tool, so you see the signal the ECU is actually seeing. The R32 GT-R uses both connectors. The later cars do not. Buy USA legal Nissan Skylines here! Can we use a Kouki oem ecu to a Zenki BNR32? Like say the GT-R originally has the ecu # 23710-05U02, but now were gonna use another BNR32 ecu w/c has # 23710-05U61. Is it ok? AFAIK, the only different computer is the ATTESA one from the V-spec vs. non v-spec. As you would say the V-Spec ATTESSA computer is "tuned". Can you use a V-spec Attesa computer on a non v-spec? Will it work properly? You can use a late or early with no real issues. The 02 sensors are different on the R33 and R34, but you can also use those. The majority of the pins are the same. A little rewire to use an early ECU in an R34 but it can be done. Anyways, how about the ATTESA computer for the BNR32, are they interchangeable for the v-spec and standard? I they're quite different.